(Left,) Paul Johnston, along with David Hekelaar (Right) of TDT standing next to Gill and Alfie Gray and the visiting Students Charities Campaign. As part of the journey to get all the funding in place to convert our former Doctors Surgery into a community hub, the Tarves Development Trust applied for assistance for some works (mostly disabled access) for the building. 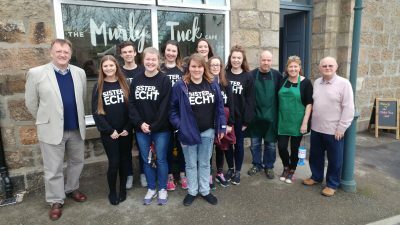 Tuesday, the Student Charities Campaign (and some of the cast of Sister Echt, this years Student Show next week in HMT) visited the Murly Tuck to see the work, their grant has helped achieve.. The Murly Tuck were running trials and training for the staff but were happy to serve the visiting students and some passing locals. The grant from the Aberdeen Student Charities campaign was an essential element along with monies from Aberdeenshire Council top up budget, contributions from local developers to make it all happen in a complex package helped by Social Investment Scotland who support Scottish Social Enterprises with loans. David Hekelaar and Cllr Paul Johnston, both founding trustees of Tarves Development Trust (TDT) were there to thank the students and explain the nature of the enterprise. Gill and Alfie explained they run the cafe as a business and the rental that helps the Trust with building a surplus for community funds. 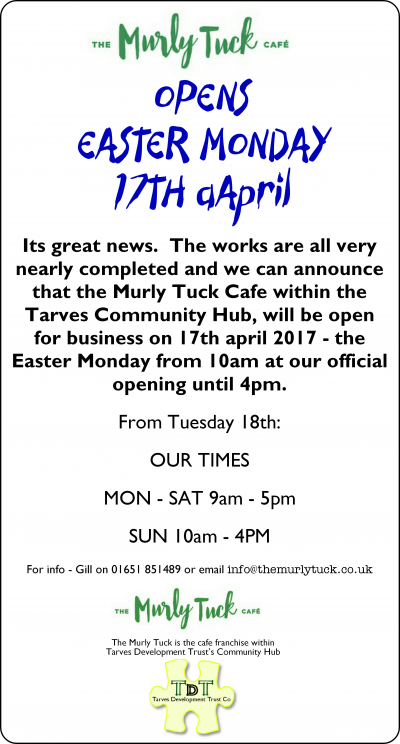 The Murly tuck, run by Gill and Alfie Gray is the cafe operated in the hub and will be formally opened by Mrs Laing, whose husband was the village’s long serving GP that opened it as a surgery many years ago. Now with a new lease of life ahead, refurbished and lots of activity for the centre of the village. The opening is at 10am on Easter Monday and the Murly Tuck will be open from Tuesday 9am to 5pm onwards.